I’ve had real moonshine, both rotgut and some decent but powerful stuff that’ll put hair on your chest and get you drunk with two shots. Troy Ball of Asheville Distilling Company is not making your grandfather’s moonshine. 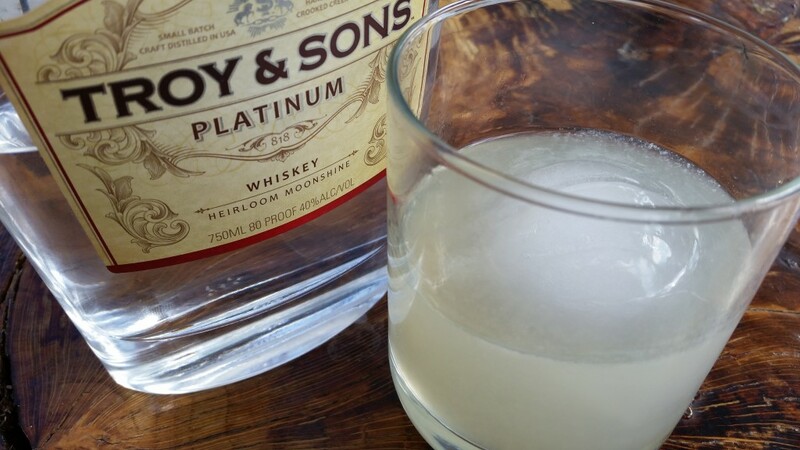 Troy and Sons Platinum Whiskey is what they call an heirloom moonshine made from heirloom corn (that’s corn that still uses a traditional heirloom seed, the same that has been used for generations). When she moved to North Carolina, Troy Ball was visited by a few of her neighbors who shared their homemade moonshine with her, and she wanted to improve and produce that same quality for her customers. Thus, Asheville Distilling Company was started, and the Troy and Sons line of heirloom whiskey was born. The Platinum Whiskey is unaged and tastes like pure corn. It’s one of the smoothest whiskeys I have ever tasted, and its so easy to drink that it makes me wonder how this is even related to other whiskeys. It’s sweet and causes nothing related to an alcohol burn. On ice, it mellows even further, perhaps a bit too far, losing some of its pure corn taste. I prefer it neat. For this one, I wanted something simple that wouldn’t obscure the corn taste. With a dash of peach bitters, it tastes like southern summer. Growing up in small-town South Carolina, I know what that’s like. shake well and strain into a lowball glass with a large ice cube. The corn comes through and mixes nicely with the peach. It’s aromatic, but only slightly so with so little bianco vermouth. If you’re from the south, you’ll recognize the flavor immediately: summer. If you’re from the north, you’ll have to take my word for it. I like the idea of a super smooth whiskey… I may dare to try it neat. Right now whiskey based cocktails are my favorite, they are perfect for the winter season. This stuff is really good, no doubt, but it’s nothing like bourbon. The sweetness is from corn, not from aging the whiskey. So it doesn’t have that caramel or butterscotch or vanilla flavor typical with bourbon. Sign up to our feed to get cocktails in your inbox! Contact us to send us press releases, samples for review, or for more info.